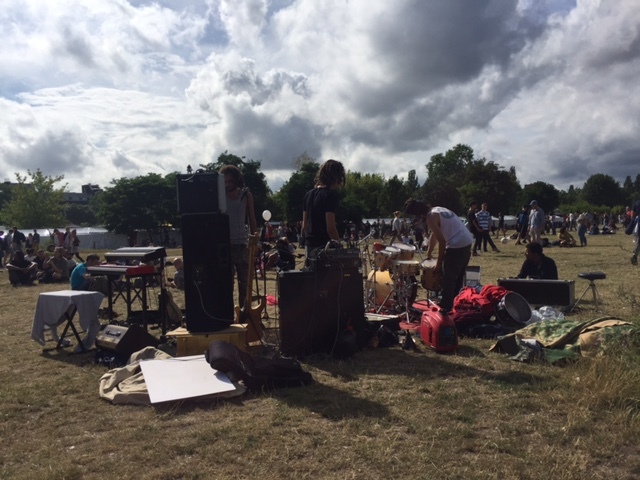 Mauerpark Sundays are like taking a trip to Berlin’s heart. A mix of rundown park, Berlin Wall monument, public hangout, flea market, pocket music festival, karaokeville, this place should be on everyone’s list visiting Berlin. Especially during the warmer months. Tip: Make sure to come here on a Sunday to get the full experience. The park is relatively uninteresting during the week. As soon as you arrive at Mauerpark on a Sunday you will be taken by a very unique energy. It is a bit chaotic at first, but the more you hang out, the more you will be able to admire the details, the people and soak up the atmosphere. It’s like looking at a very busy street life photography. Look at it long enough and you will discover so many layers and stories! 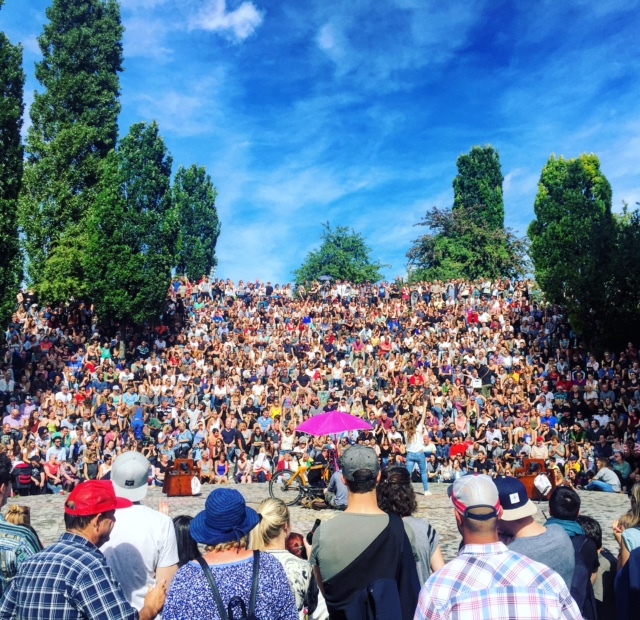 Mauerpark Sundays are all about the people! 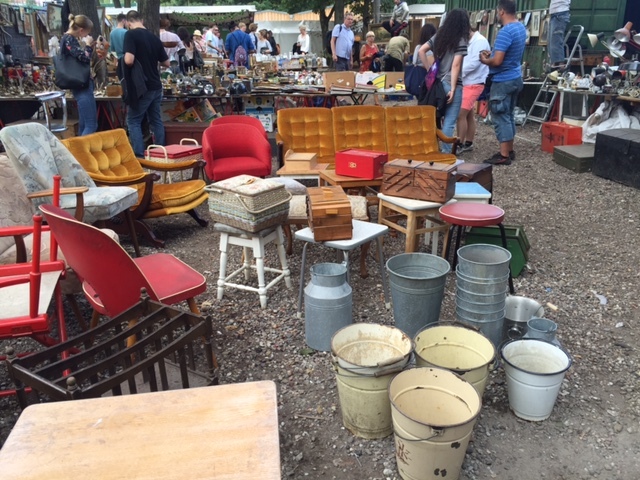 Get there earlier (or much later) to appreciate the flea market area. It gets super busy around noon and it is virtually impossible to enjoy it. If you do get there around that time, skip the market and go explore the park area. Walk along the path where the Berlin Wall once stood. Be here during the spring and you will witness the beautiful cherry trees in bloom. You will find street performers and musicians (some of them are amazing) all along the way. Climb the hill to the East of the Wall path and explore some street art. Take in the view from up there. If you are feeling adventurous, go on a swing ride (yes! for adults!!). Folks usually find a spot on the hill area and hang out, especially during sunset. Find the amphitheater, grab a seat. It will fill up. People gather here for one of Berlin’s classic experiences: the Bearpit Karaoke. A giant public karaoke experience. Folks volunteer and sing to a very animated and fun crowd. Sometimes the performer are truly amazing. You might just be so lucky! In the end, the whole experience is unique and totally worth it. Along the way, to the west, there is a green area called Mauergarten. This is a great area for a picnic or just to hang out with friends while drinking beer. Musicians also use this area for some performances. You are welcome to bring your booze and snacks. Take part in the karaoke if you like the attention. In the end, nothing beats just finding a spot and observing Berlin life and a very intereresting mix of people. 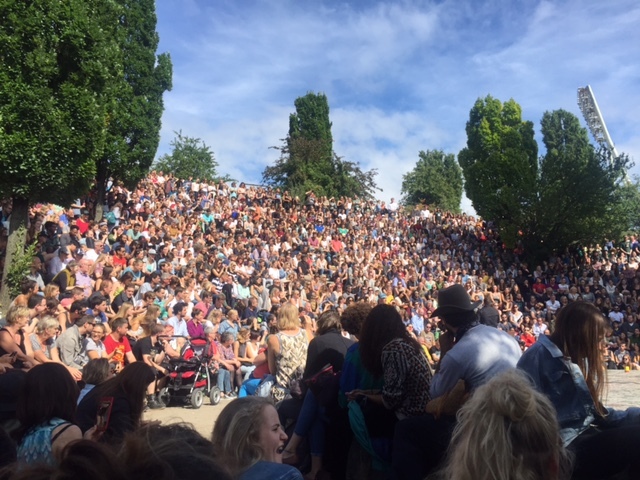 Mauerpark is a magical place that brings people from all backgrounds, ages, races, ideologies together. Very Berlin! If you feel like learning a bit more about Berlin’s recent past, make sure to visit the Berlin Wall Memorial, just a stone’s through away along Bernauer Strasse. For more tips about exploring the neighborhood, check this article we wrote about Prenzlauer Berg. Find out more ideas on how to explore Prenzlauerberg also check out: Kulturbrauerei (Prenzlauer Berg’s “Culture Brewery”) and/or our Guide to exploring Prenzlauer Berg.